What Are Symptoms and Signs of Esophageal Cancer? What Types of Specialists Diagnose and Treat Esophageal Cancers? How Do Health Care Professionals Diagnose Esophageal Cancer? What Is the Prognosis for Esophageal Cancer? What Is the Survival Rate for Esophageal Cancer? How Can I Prevent Esophageal Cancer? Squamous cell carcinoma arises from the surface (epithelial) cells that line the esophagus. Adenocarcinoma arises from the esophageal glands or within a segment of Barrett's esophagus (see below). Although tumors can arise anywhere in the esophagus, adenocarcinoma arise more frequently in the lower portion while squamous cell carcinoma arises more frequently in the upper portion of the esophagus. Other tumors types are rarely seen (lymphoma, melanoma, or sarcoma). Esophageal cancer is a disease where the tissues of the tube-like structure that connects the throat to the stomach (esophagus) become malignant (cancer). Esophageal cancers may be generally termed "esophagus cancer" or more specifically termed in relation to their location and type such as "gastroesophageal junction adenocarcinoma" (meaning an adenoma located where the stomach and esophagus are connected). According to the American Cancer Society and others who treat esophageal cancers, the exact cause or causes of this disease are not known. However, researchers suspect that certain risk factors (see below) may cause DNA damage in cells that may result in the disease. Both types of esophageal cancer more commonly affect men older than 60 years, but risk factors for adenocarcinoma are different from those of squamous cell carcinoma. Adenocarcinoma of the esophagus is most commonly seen within a segment of Barrett's esophagus, where they arise from chronic peptic sores in the lower esophagus. This is an acquired condition characterized by precancerous cells that replace the normal cellular lining of the lowest portion of the esophagus. 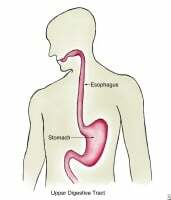 The condition occurs as a complication of chronic reflux of gastric contents (GERD) into the lower esophagus. Squamous cell carcinoma occurs more commonly in people who heavily use tobacco and alcohol or who have previously swallowed some caustic substance, for example lye. The disease is also more common in people who have been diagnosed with squamous cell cancer of the head and neck. Men are up to five times more likely than women to be diagnosed with esophageal cancer. Among men, African Americans have the highest rate, more than 2.7 times greater than the rate for non-Hispanic white men. Incidence rates generally increase with age in all racial and ethnic groups. Cancer of the esophagus is a common cancer in developing countries of the world, where most tumors are squamous cell cancers. In the developed world, adenocarcinoma is becoming more common than squamous cell cancer. Symptoms of esophageal cancer usually do not show up until the disease has reached an advanced stage. The most common symptom is difficulty swallowing (dysphagia). Initially, swallowing solids is difficult. Over time, even swallowing liquids becomes difficult. The following symptoms may accompany cancer of the esophagus. Any of these symptoms are indications of advanced disease and should be considered as a sign to get medical attention. Your team of doctors may include gastroenterologists, oncologists, surgeons, radiation oncologists, pathologists, and support personnel such as dietitians. Together, they can develop diagnostic tests and treatments best suited for your individual disease. The best diagnosis is based on findings from an endoscopic examination of the esophagus. This study may be carried out either in a hospital or in a doctor's office. The doctor administers a topical anesthetic to the throat to suppress the gag reflex. Doctors frequently give intravenous (IV) sedation just before the procedure. The doctor then inserts an endoscope into the esophagus. An endoscope is a thin, flexible plastic tube that contains fiberoptic bundles. Using a tiny camera in the endoscope, the doctor searches the surface of the esophagus for areas of concern and may biopsy tissue. Doctors define esophageal tumors in terms of their size and location. These factors are important in determining the stage of the cancer and treatment options. The doctor can take biopsies to confirm whether the abnormality is a cancer and to determine its type. Upper gastrointestinal (GI) barium contrast studies help the doctor to detect cancers but may fail to detect small tumors more easily seen through endoscopy or esophagoscopy. Endoscopic ultrasound: Pictures created with sound waves passed through the endoscope can help to determine the depth of invasion of the cancer and the status of the surrounding tissues, including lymph nodes. Treatment for esophageal cancer depends on the results of tests and your underlying health. People with advanced heart or lung disease may not be candidates for aggressive therapy. In many cases, the esophageal cancer has advanced too far for any available treatment to work. In otherwise healthy people with localized disease, surgery may offer the best chance at long-term survival. Surgery involves removing the diseased portion of the esophagus and connecting the remaining portion to the stomach (resection). Preoperative chemotherapy and radiation often accompany surgery. Studies now under way will determine whether combination chemotherapy and radiation therapy without surgery is as effective as surgery in lengthening long-term survival. Present results give conflicting opinions. Research continues. When the esophageal cancer has spread to organs beyond the esophagus, long-term survival is uncommon. The chance of recovery improves when doctors detect the cancer at an early stage. Five-year survival can exceed 50% for stage 1 esophageal cancer. This drops to 20% in stage 2, 10%-15% in stage 3, and is still essentially zero for stage 4. Once cancer invades the muscle layer of the esophagus, most people already have developed widespread cancer. For these people, cancers invariably come back following surgical removal. Few people survive long term. Following completion of therapy, whether with surgery, radiation, chemotherapy, or a combination of these, the patient needs regular follow-up endoscopic examinations as well as repeat CT scans of the chest and abdomen. Often, people who undergo surgery of their esophagus develop significant side effects, such as narrowing at the site of the surgery. They require frequent esophageal dilatations or insertion of stents. Reducing use of tobacco and alcohol can reduce the frequency of squamous cell carcinoma of the esophagus. Today it is recognized that HPV infection increases the risk of squamous cell carcinoma of the esophagus three-fold. HPV vaccination programs for young men and women can be expected to reduce the risk of this disease over time. Adenocarcinoma of the esophagus is a frequent complication in Barrett's esophagus, which may be found in some people with symptoms of gastroesophageal reflux disease (GERD). People with frequent symptoms of acid reflux (heartburn or regurgitation) should undergo screening with endoscopy. People with Barrett's esophagus should have regular endoscopic tests to detect precancerous changes of the esophageal lining. They also require tight control of the symptoms of gastroesophageal reflux, which may include dietary and lifestyle changes as well as medications and possible surgery, to prevent progression of Barrett's esophagus. The esophagus lies between the mouth and the stomach and serves as a conduit for food and liquids to the gastrointestinal tract. Dysphagia means difficulty swallowing. Odynophagia means painful swallowing. Sometimes it is not easy for individuals to distinguish between these two problems. Dysphagia has many causes. First, there may be physical (anatomical) obstruction to the passage of food. Second, there may be abnormalities in the function (functional abnormalities) of the nerves of the brain, throat, and esophagus whose normal function is necessary to coordinate swallowing. Finally, there also may be abnormalities of the muscles of the throat and esophagus themselves. What treatment has been effective for your esophageal cancer? How was your esophageal cancer diagnosed?